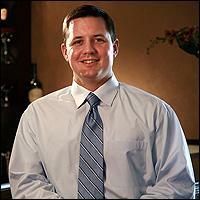 Kevin Boyer wants to get all wine regions represented on Ruth's Chris wine lists. Kevin Boyer, 30, earned his first-level Court of Master Sommeliers certificate at a seemingly unlikely place: Walt Disney World. Boyer studied for the exam while working in Orlando as sommelier and wine educator at the resort's Pacific Northwest-themed restaurant, Artist Point, where he was responsible for training the restaurant staff. In 2001, the young sommelier accepted a position developing wine lists for the Ruth's Chris Steak House chain. As vice president of beverages for Ruth's Chris, Boyer is responsible for creating the chain's wine lists, along with the help of regionally-based wine experts, who are the designated beverage managers for each restaurant and their customers' tastes. This year, 92 of the 128 Ruth's Chris Steak Houses applied for and won Wine Spectator's Award of Excellence. Boyer recently discussed the challenges of overseeing wine lists for more than 120 restaurants and making sure the beverage manager at each location is passionate and well-educated on the subject of wine. Wine Spectator: What was your introduction to wine? Kevin Boyer: I wish I had a really great story, like I was walking down the street and a bottle of wine hit me. Honestly, my first introduction to wine was my family. My mother owned and operated a [product]-demonstration company [in Nashua, N.H.], so as a child, it wasn't strange to have pioneers from California wine country in the northeast. At a very early age, I was presented with wine since it was always around. My love for wine came from … seeing the love and passion of these pioneers. This instilled in me that it was a fun, living, breathing thing. I wouldn't say I was buying it at an early age—well, maybe a little too early! WS: How did your time at Disney's Artist Point prepare you for your current position at Ruth's Chris? KB:I worked at Walt Disney World from 1998 through 2001. They were trying to revamp their [wine] programs and started an educational program with the Court of Master Sommeliers for key employees. It wasn't just reserved for managers, key executives, but the focus was on making sure all employees had knowledge about wines, whether it was a server, a hostess or a manager. It really prepared me for what I am doing now from a global, wine-education standpoint. WS:What are some of the challenges of running the wine program for a chain, particularly an American steak house? KB: My job is to set up all the core lists—wines, spirits for all the restaurants, and 75 percent of wines are core [selections], and each restaurant is welcome to fill in the remaining 25 percent with local selections. Obviously, from our sheer size and the amount of restaurants we have, and the amount of wine we go through, it makes it difficult to get everybody the same wines, which is why we do a lot regionally. We have restaurants in Portland, Ore., or close to Napa Valley, and when we are close to a region that has great wines, we certainly use an influx of local wines. In other states, we have a large selection of Virginia wines [or] New York wines. But education is my primary focus. The big task is making sure that each beverage manager at each restaurant is passionate, excited and well-educated. We have [educational] partnerships with the Court of Master Sommeliers, local wine educators and many of our different wine vendor partners like the Gallo Wine Academy. We invite all employees to get certifications at our cost. We also have Wine Quest, which is an online training in wine, sales and service standards. It's a three-month program that deals with three levels—introductory, intermediate and advanced. All of our employees are required to take the preliminary testing. WS: What are some popular wines at Ruth's Chris? KB: Being a classic, American steak house, California Cabernets are certainly a staple. However, in the past six to eight months, we've seen an influx of European wines being ordered, a lot of Châteauneuf-du-Papes and Rhône varietals. It's partly due to Southern California getting more traction with the Syrahs. Varietals in emerging areas such as South Africa have more bang for the buck. Our wine list is 70 percent red and 30 percent white, which is probably pretty standard for a steak house. Chardonnays make up 60 percent of the whites, but we've seen good traction lately on the alternative whites, like the white blends, the Marsannes, the Roussannes, white Côtes du Rhônes. … The way we get our guests interested in trying new things is with food pairings. WS: What are some unusual pairings you've had over the years? KB: My personal favorite: Champagne and popcorn. Honestly, our menu makes my job easy. We have a very classic menu with steaks being a majority of what we do. We do use full-bodied whites and reds when we pair. Our veal and sweet peppers is probably the hardest dish on the menu to pair, because it's got butter as well as peppers that we [marry with] vinegar, which can be a trick. Châteauneuf makes a great pairing. It's experiential. Everyone just falls back on red when they are in the restaurant, but it's getting them to realize that there are many great whites that pair with steak and other heavy dishes. KB: Champagne is a phenomenal region. I am currently enjoying a lot of great cavas from Spain as well. … I'm a Champagne guy. Any great Champagne is my favorite. I can't tell you if there is one favorite out of all of them. I haven't met many Champagnes that I didn't like. It's a versatile food-pairing wine as well. It's just hard to beat good Champagne! But I'm always trying new regions, trying to find the best out there. Like now, we're dealing with South Africa. They have some of the best wines in the world, not only the unique wines, like the Chenin Blanc and the Pinotage, even their Cabernet [Sauvignon], Chardonnay and blends. … I think South Africa is closest, stylistically, to American palates. In the global wine world, there are so many things to be had, and it's fun exploring them.